Another example of adding cell comments to a worksheet. This example demonstrates most of the available comment formatting options. For more details see Working with Cell Comments. # Each of the worksheets demonstrates different features of cell comments. # Example 1. Demonstrates a simple cell comments without formatting. # Set up some formatting. # Example 2. Demonstrates visible and hidden comments. cell_text = "This cell comment isn't visible (the default)." # Make all comments on the worksheet visible. # Example 4. Demonstrates changes to the comment box dimensions. # Example 5. Demonstrates changes to the cell comment position. # Example 6. Demonstrates changes to the comment background color. # Example 7. 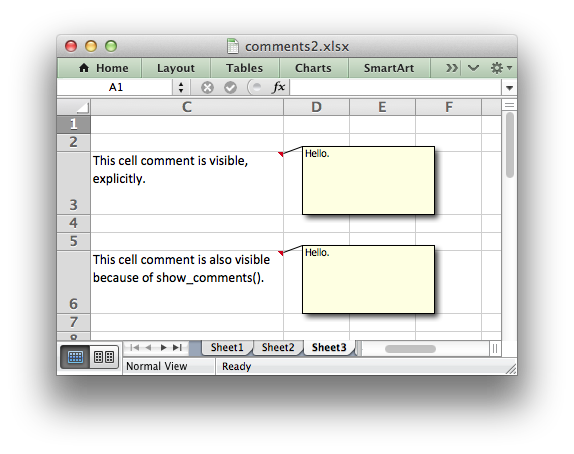 Demonstrates how to set the cell comment author. cell_text = ("Move the mouse over this cell and you will see 'Cell commented "
# Example 8. Demonstrates the need to explicitly set the row height. "and thus the comment box is stretched as well.\n\n"